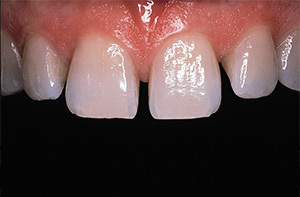 When teeth are decayed, cracked, stained or chipped, they may detract from an otherwise beautiful smile. To restore your dental health and appearance, a porcelain Crown or Veneer may be an option. One of our main goals is to create crowns and veneers that look like natural teeth, so we take into account the colour, occlusion, shape and length of both your natural teeth and the artificial crown. Any one of these factors alone can significantly affect your appearance. So we closely work with our superb local dental technicians to provide you with a beautiful, functioning restoration. A number of different materials can be used to produce a crown, and these will be discussed with you at the time of treatment planning. If you have a certain look in mind for your crown, discuss it with us at your initial appointment. When the procedure is complete, your teeth may not only be stronger but they may transform your smile and facial appearance. 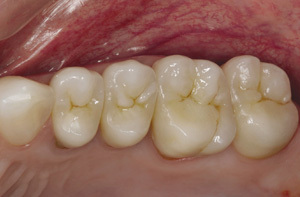 Crowns are used to restore severely broken down teeth that are too weak to support a conventional filling. Our crowns look very natural and feel just like your own teeth. Crowns are extremely versatile and can be used to align crowded or protruding teeth, to close gaps or to lighten tooth colour. 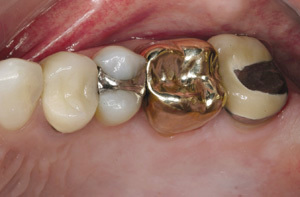 Where aesthetics are important, such as in the ‘smile line’, we use porcelain or all-ceramic crowns; but sometimes it is necessary at the back of the mouth, where strength is paramount, to use gold crowns. A discoloured or misshapen tooth can be disguised by fitting a custom-made porcelain facing to the front of the tooth to hide the discrepancy. A cosmetic smile makeover will often involve the placement of veneers on all visible teeth in order to harmonise the size, shape and colour of your teeth in your new smile. We prepare the tooth, take an impression and have the veneer hand-crafted in the laboratory before bonding it to the front of your tooth. Veneers are extremely versatile and can be used to align crowded or protruding teeth, close gaps and to lighten the teeth. 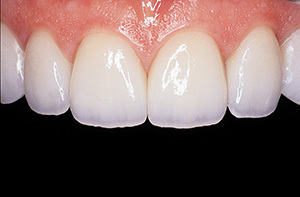 Using modern materials and techniques, we are able to place tooth-coloured composite coverings over the front of the tooth (as for porcelain for veneers) but these may be carried out in a single appointment, avoiding the need to wait for a laboratory-made veneer. Composite also has the advantage that it can be more easily repaired and polished throughout the life of that veneer, rather than having to be replaced.